Western Pennsylvania police say they’ve identified two men they say are suspected of stealing thousands of dollars of iPhone and Apple Watch devices from Walmart stores in New Jersey and Pennsylvania. TribLive reports a pair of men from Philadelphia are accused of nearly $41,000 worth of cellphones last month from the Walmart store in Frazer Township, Allegheny County, police say. And the same pair are suspected in similar thefts in at least two other states. Frazer Township Police Chief Terry Kuhns called the pair’s tactics in stealing the iPhones using suitcases sophisticated and organized. The store video showed the men going to the electronics section after entering the store around 2:30 a.m. They waited for an employee to walk away and then dragged two suitcases over to an iPhone display case, pried the case open and filled the suitcases with merchandise. They ran when an employee confronted them and left the store in two vehicles, TribLive writes, citing court documents. The men made off with a suitcase containing 47 iPhones, the complaint said. They left behind another suitcase containing up to 20 Apple watches. The men made it out of the store with a suitcase full of 47 iPhones, although they left behind another suitcase, which contained up to 20 Apple Watches. The suspects have been identified as James J. Jordan, 42, and Jahmir Andre Mitchell, 19, both from Philadelphia. The duo remains at large, and face felony charges of participating in a corrupt organization, receiving stolen property and retail theft and a misdemeanor conspiracy charge. The pair are also being looked at as suspects in a similar theft at a Walmart in South Strabane, Washington County. In that theft, multiple suspects used suitcases to steal at least $25,000 worth of iPads. 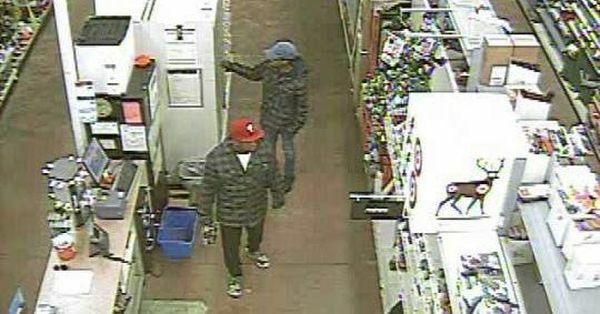 They are also suspected in a $25,000 theft of iPhones and Apple Watches from a North Brunswick, N.J. Walmart back in October.